Art and Web Design offers top quality web site designs. Well-planned navigation, unique logos, graphics, slideshows, and attractive color schemes make our sites distinctive and user-friendly. All at very affordable prices. A unique logo/banner designed for your business is included with your site. You will also be provided with a graphic file of your logo suitable for print purposes. 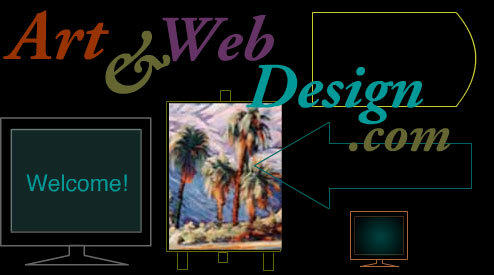 Specializing in artistic logos and banners to give your website a distinct look. Satisfaction guaranteed. Send us an EMAIL with your ideas. Original oil and acrylic paintings by Shirley R. Williams, in a style influenced by Early California and French Impressionism. Williams has a degree in art and over 50 years painting experience in landscape, portraits, and still life. New paintings 2017-2018 are now on view! Copyright 2018 - Art and Web Design - All rights reserved.